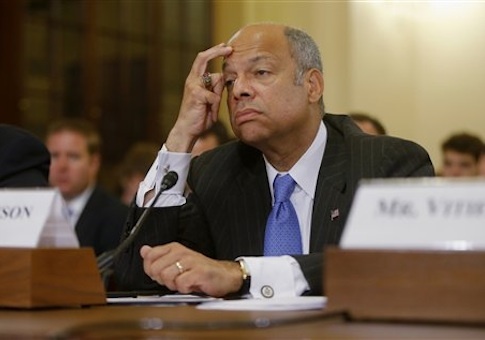 The Department of Homeland Security is struggling to handle a "mass exodus" of some 52,0000 unaccompanied immigrant children who have illegally crossed the U.S. border in record-breaking numbers over the past several months, according to testimony Tuesday by DHS Secretary Jeh Johnson. The number of illegal children crossing the border has more than doubled since last year, when some 24,000 unaccompanied minors were apprehended. More than 52,000 illegal children have crossed from October to mid-June, according to Johnson, who admitted that the unprecedented influx is stressing DHS resources at the border. More than 250 children are being apprehended every day along the southern border; U.S. Customs and Border Patrol estimates that more than 150,000 unaccompanied children will illegally enter the U.S. in the next year. The massive wave of illegal border crossing has taxed DHS and CBP in the past several months and prompted outrage on Capitol Hill, where lawmakers maintain that the Obama administration’s lax immigration policies have fueled the influx. "The president needs to immediately send the National Guard to the southwest border to deal with this crisis," said Rep. Michael McCaul (R., Texas), the Homeland Security Committee’s chair. "Patrol stations are not set up to handle this massive and growing number of detainees. Let alone children." "This is a crisis. It's a crisis that's been in the making for years," McCaul said. "One that we should have seen coming. But few concrete actions have been taken. The Department of Homeland Security and the United States government as a whole has been slow to act, turning a blind eye to the warning signs." A temporary processing facility has already been established along the border and a second facility is set to go online this month, according to Johnson and Federal Emergency Management Agency (FEMA) Administrator Craig Fugate, who testified before the House Homeland Security Committee. McCaul blamed the rise on a "series of executive actions by the administration" that have wrongly encouraged poor residents of Southern American countries to believe that they can cross the U.S. border with no repercussions. "The relaxed enforcement posture along with talk of comprehensive immigration reform; It is beyond dispute that such a narrative shapes behavior and encourages people to come to our country illegally," said McCaul, who expressed shock that military bases along the Southern border have turned "into refugee camps." Johnson explained that smuggler and various publications in Mexico and elsewhere have launched campaigns to convince people that they will get a "free pass" is the illegally enter the United States. There’s a "push factor," Johnson said, a "disinformation campaign out there that there is permisos, a free pass, that you get a piece of paper that says, ‘Welcome to the United States, you’re free.’"
"What is critical is we correct the record and straighten the perceptions," he said. Ronald D. Vitiello, CBP’s deputy chief, warned that if the flow is not stemmed soon DHS will become overwhelmed. "We are concerned as this goes on about staffing levels and our ability to do the other order patrol functions" that CBP is tasked with, Vittello said. McCaul urged Johnson and the administration to take a more proactive approach to the problem. "This problem will continue until we provide a deterrence," he said, "a strong message that if you do come, you cannot stay." This entry was posted in Issues and tagged DHS, Illegal Immigration, MIchael McCaul, Obama Administration. Bookmark the permalink.